Timestamping has been around for quite some time and is being used throughout the world in multiple industries. To put it plainly: a timestamp proves that certain data (contracts, research data, medical records,…) existed at a certain point in time. Their purpose is to eliminate the possibility for the owner to backdate the timestamp. In other words: there’s no hocus pocus possible. Your timestamp is unalterable. Mommy, where do timestamps come from? A timestamp is issued by a timestamp authority. This is a company which is officially recognized by the government. However, before July 2016, there was no clear European regulation concerning the legal value of timestamps. Europe being Europe, a lot of countries had their own regulations, which in turn had implications on the legal value of timestamps in an international context. For example: a judge in Germany was not obliged to accept a timestamp coming from a French company, making everything mucho complicado. Luckily, all this changed on July 1st, 2016. Since then, EU Reg. 910/2014, art 42 (pardon our French) states that timestamps are accepted as proof in legal proceedings. And that’s good news for you. Click one button and hold your breath for 26 seconds. Here’s what happens at breakneck speed. 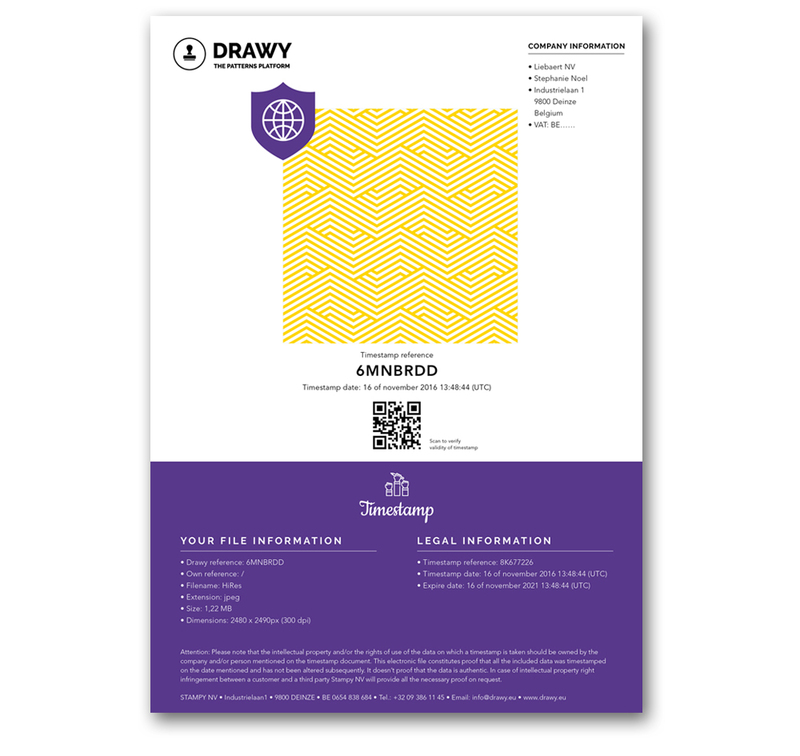 Once your design is uploaded, we generate a code called the “Drawy reference” which is electronically sent to a timestamp authority, who then links it to a timestamp. This is where the magic happens. The timestamp authority then sends the whole shebang back to us. We immediately pile together all the info in a neat PDF document, providing you with legal proof that your print existed at a certain moment in time. Ok, you can breathe again now. That’s a nice PDF file. What does it say? The Drawy Reference: basically, an internal reference linked to your design . It is directly linked to your deposit reference. The Deposit Reference: this reference is linked to the timestamp. The Deposit Date: this is the date on which your print was officially registered. This date proves that your design officially existed at this moment in time. Of course, PDF files can be easily forged. That’s why we’ve developed a sophisticated function allowing you to easily verify if a design is indeed protected. Type in both the Drawy reference and the linked deposit reference. In the wink of an eye, you’ll now if you’re looking at legitimate documents. To sum things up: timestamps are a life-saver for designers. And thanks to Drawy technology, you can timestamp every single one of your designs in just 26 seconds. That’s four times the time you need to tie a Windsor knot. Or say Supercalifragilisticexpialidocious twelve times in a row.